The Amazon Rewards Visa Signature Card currently has an Informr score of 8.6 out of 10. This score is based on our evaluation of 11 sources including reviews from users and the web's most trusted critics. Amazon Rewards Visa Signature Card is typically available to those with good credit scores (650 or greater). This is one of the best cashback cards around. Unlike other cards, there’s no limit to the cash back you can earn, and the 3 percent (or 5 percent with Prime) return for Amazon purchases is not offered with any other credit card. Since there’s no annual fee, all the cash back you earn is yours. If you were a non-Prime member at Amazon and felt left out of the credit card rewards fun, then you can bank on the simple Amazon Rewards Visa Signature Card. It offers similar benefits, albeit lesser benefits, but you can enjoy a simple return on purchases made at Amazon. Earn $50 Amazon.com Gift Card that will be instantly loaded into your Amazon.com account upon the approval of your credit card application. If you’re an Amazon Prime member, the Amazon Rewards Card provides an excellent way to earn more cash back whenever you shop on Amazon. That said, its rewards rate on other categories isn’t great, and the sign-up bonus is underwhelming. As a result, the card is best used in tandem with another credit card that can give you better rewards rates on non-Amazon.com purchases. If you often shop on Amazon or at Whole Foods Market, the Amazon Rewards Visa Signature Card could be a solid option. You’ll get to earn bonus points at those shops, plus earn bonus points at gas stations, restaurants and drugstores. Points can be redeemed for cash back, gift cards, travel or be put toward your Amazon purchases. Every point you earn with the card comes as a pure reward since you won’t pay an annual fee. The Amazon.com Credit Card figures to become increasingly popular, not to mention more valuable, as Amazon.com strives to canopy the farthest reaches of digital-age commerce. The Amazon.com Rewards Visa card offers a solid amount of cash back on Amazon.com purchases and also gives cardholders an extra boost at restaurants, drug stores and gas stations. The Amazon Rewards Visa Signature Card is best for those who shop regularly at Amazon.com (especially Amazon Prime members), and whose budget includes gas, drugstore, and restaurant expenses. 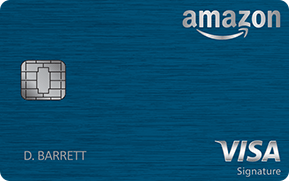 The credit card you want if you’re an Amazon fan. Even though I’d consider another cash back card, because I enjoy in-store shopping more, this little card can really help you save money on your online purchases at Amazon.com.